An autism spectrum disorder (ASD) diagnosis can be difficult news to hear. Parents of newly diagnosed children, or adults with autism, actively seek out treatment methods that relieve the anxiety and stress that can accompany autism. When anxiety and stress are relieved, daily functions improve, sometimes dramatically. One gentle and reliable method that can often provide this welcome relief for people with ASD is craniosacral therapy. Craniosacral therapy is a manual, hands-on form of therapy that promotes improved health, both physical and emotional, via gentle touch to the head, neck, and spine. When possible, the individual receiving craniosacral therapy will lie down while the therapist uses his/her hands to focus on key symptom-relieving regions. The therapist maintains physical contact throughout the session, which may last as little as fifteen minutes, but often lasts as long as an hour or more. The therapist will then perform a gradual, gentle series of manipulations intended to promote muscular and emotional release. The goal is to tune into the craniosacral rhythm of the recipient’s body, working to move the muscles and bones in time with that rhythm. These manipulations and adjustments aim to improve circulation, mitigate pressure, and encourage the flow of cerebrospinal fluid, which the body produces to insulate and cushion the brain and spinal cord and remove toxins and cell waste from the central nervous system. This treatment relieves restrictions, or areas that are not moving in a prescribed and healthy way, which increases activity in the parasympathetic nervous system. As a result, physical symptoms and emotional challenges can be soothed and potentially eliminated. How Does Craniosacral Therapy Benefit People with Autism? 1. It delivers a healthy dose of bonding hormones. First and foremost, as a hands-on form of therapy, craniosacral therapy presents the recipient with a healthy, even pleasant flood of oxytocin. Oxytocin is a hormone often associated with childbirth and breastfeeding, but it occurs in the human body throughout the life cycle. The body produces oxytocin when there is extended physical contact between people, generally with skin-to-skin contact. Because of social challenges and possible physical discomfort, some people with ASD may produce far less oxytocin than the average person, leading to feelings of disconnectedness, isolation, and even depression or anxiety. Having a compassionate individual place hands on one’s body with the caring intention of lessening discomfort and improving one’s daily life can help kick-start oxytocin production, creating feelings of connection and increased well-being. “Many parents ask if craniosacral is worth trying, because their child rarely lets anyone touch them. I find those kids to be the ones that end up loving craniosacral the most! I’ve had several non-verbal kids on the spectrum who spoke their first words asking for more craniosacral,” says Bek Wiltbank, Seattle-based craniosacral and occupational therapist. 2. It provides a meditative experience. Many doctors and therapists recommend yoga and meditation practices for those diagnosed with an autism spectrum disorder. This is because the ability to quiet the body and mind when necessary not only decreases tension and anxiety, but improves the ability to deal with stress and other negative emotions. Because craniosacral therapy sessions generally take place in a quiet, meditative space, recipients can typically relax their bodies and minds, which may help them feel more in control of their mood and actions in everyday situations. While each individual on the autism spectrum is unique, several people struggle with muscular tension. Whether this is the result of co-morbid conditions or due to increased physical activity or emotional tension caused by challenging social interactions, this symptom can be especially tricky to mitigate. Craniosacral therapy can melt away that muscular tension. Those with ASD, in particular, may have difficulty slowing down and relaxing. Craniosacral therapy can help recipients learn to relax physically, mentally, and emotionally. 4. It can build the patient’s trust in their therapist. One potential symptom of ASD is that it can impede social development and result in anxiety-triggering social interactions. By developing a routine of regularly anticipated appointments with a craniosacral therapist, the patient can develop a mutually beneficial relationship with his or her therapist. They may come to enjoy and even look forward to regular craniosacral sessions as a time of relaxation and physical relief. This positive relationship can help the patient feel more confident in other social situations. Bailey Rory is dedicated to the autism community and aims to spread awareness through guest-blogging and volunteering at community activities in her home state of Washington. In her free time, Rory enjoys connecting with the great outdoors through climbing, hiking, sailing, and going for scenic bike rides. Bek Wiltbank is an occupational and craniosacral therapist, but above all, she is an advocate for children. She started her Seattle-based practice to help babies and kids find relief from pain, anxiety, discomfort, and dysfunction, ultimately helping them achieve a joyous childhood and progress into happy adults. Her mission to bring health and comfort to others’ lives also rings true in her adult treatment approach. Bek holds a bachelor’s degree in neuropsychology with a minor in women’s studies and a master’s degree in occupational therapy. Bek also teaches classes on pediatric craniosacral therapy to help parents and loved ones learn about the extensive benefits that babies and children receive from treatment. Craniosacral therapy was developed by Dr. John Upledger at Michigan State University in the 1970s- 1980’s. The first population he tried his techniques on were children with severe autism symptoms. He theorized autism was encephalopathy even then based upon what he learned from these children. If autism, or at least some forms, are indeed encephalopathy/meningitis, then craniosacral therapy is a reasonable thing to consider as it ‘stretches’ tight meninges and soft tissues. This, in turn, allows for better exchange of fluids, opens of detox pathways, and faciliates cerebral spinal fluid to travel throughout the entire nervous system. It also may simply reduce pain and headaches, something a child who is nonverbal won’t be able to tell us. 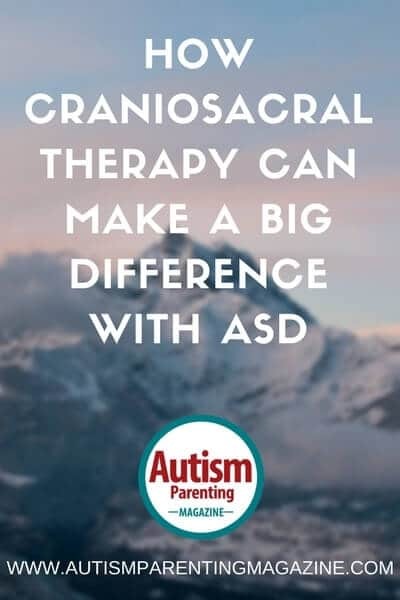 A recent scientific study on the use of craniosacral therapy for ASD showed positive outcomes in a majority of respondents and results started to occur in relatively short period of time. Try to find a therapist who is both qualified to work with brain structures as well as pediatrics. How can I find a qualified therapist near Ronkonkoma, NY? Check the history and the development of OCF. I’t began way before Upledger. Dr. Adrew Taylor Still (1828–1917) in 1908 described the cranial mechanism. His young student William Garner Sutherland (1873–1954) completed Still’s work with amazing accuracy and it continues to grow today. I suggest you read up more on Sutherland’s work. Also Magoun is far more relevant than Upledger. 1980s Bar Harbor: at a meeting of osteopaths from England and New England, James Jealous links Sutherland’s insights to the works of Blechschmidt and van der Post”.